Let me give you my Step-by-Step Blueprint for EARNING a Consistent DAILY Income! There is No Need to Stare at Your Computer All Day…Only Spend 1-2 Hours a Day & Potentially EARN A Full-Time Income! Based on solid trading principles I taught you in the work﻿shop, there are certain times of the day the market becomes incredibly predictable… those are the times where you want to capitalize on the right profitable trade set-ups I’m going to teach you! Supplement Your Income, Grow a Small Account, or Become a Full-Time Trader! You'll Learn the Skills on a Daily Basis to Help YOU Become a Consistently Profitable Day Trader & Generate Reliable DAILY & WEEKLY Income. When was ﻿﻿﻿the﻿﻿﻿ last time you saw a strategy this consistent? Now, honestly, this mentoring program is like a third child to me… I’ve put my heart and soul into this program over the years… it’s the culmination of almost 30 years of real-life trading experience and knowledge combined into one program that will take you from where you are right now, and it WILL literally transform you into a professional (day) trader, in a very logical & methodical way… unlike anything you’ve ever seen before. Gain the Confidence, Discipline, & Patience You Need to Become a Consistently Successful & Profitable Day Trader! This program was put together in a pyramid format; you start from the bottom and work your way up; there are 4 levels to the pyramid that contains 27 modules; each training module contains a PDF file & a video. You will learn exactly how I day trade, A to Z – and better yet, you’ll know exactly how to make money on a daily basis and you’ll have the opportunity to PARTNER with me and my trading team of professionals. These are the exact same trading strategies and techniques that over 12,000 traders like you have used to create a more consistent daily income… and the success YOU desire and most certainly deserve! Absolutely! In fact, most of my students have jobs. Many students focus on trading just the morning or afternoon sessions until they have more free time to trade a full day. he beauty behind the E-Mini Success Formula 2.0 methodology is that the same principles apply to any market and in any timeframe so… you're definitely not limited to only trading e-mini futures. 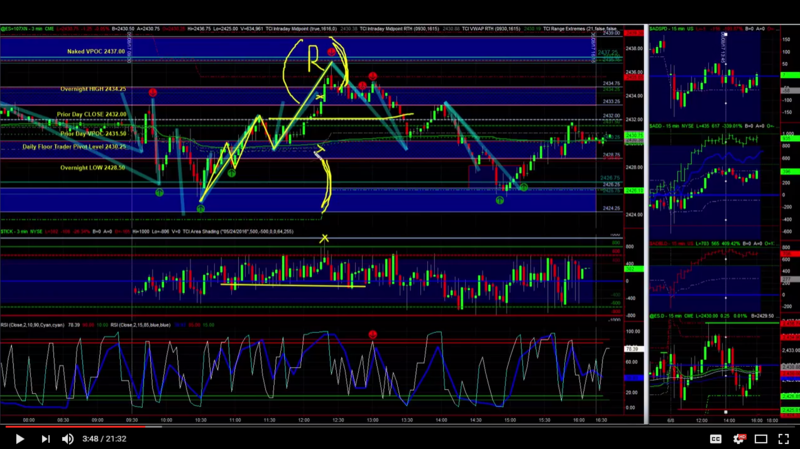 You can trade weekly, daily, hourly or even the 3-minute bars with the same strategies. And trade Oil, Gold, the Dow, Russell, etc. the same way you’d trade the S&P. If you’re not trading full-time, you may have to adjust your goal a little bit to a more modest $125 - $200 a day per contract. How Much Money Is Possible to Make Trading The E-Mini Success Formula 2.0? YES… ABSOLUTELY! Not only will you receive the complete E-Mini Success Formula 2.0 Mentoring Program A to Z, but you’ll also get access to the Opening Bell Income Strategy DAILY (OBIS DAILY) where, each morning, before the market opens… attend Craig’s LIVE Pre-Market Analysis Morning Briefing and Discussion from 8:45am ET to 9:15am ET. At the end of each trading day (4:00pm ET), join Craig and other traders, like yourself, for a LIVE Market Video Recap and LIVE Q&A Coaching Session. During this time, Craig will walk you through the trades that set up during the trading day and how to apply the trading tactics and strategies. Of course, if you can't make it work for you - even with all the unlimited support - you're protected by my 1-Year Double Your Money Back Guarantee. That's just how confident I am in my ability to help you become a better trader. With everything you get... it would be near impossible to fail! modules, I cover everything ﻿﻿from ﻿﻿Money Management and ﻿Trade ﻿Sizing (this is the most overlooked part of trading...yet probably the most ﻿﻿important ﻿﻿to your ultimate trading success; without this, you will not make money!) 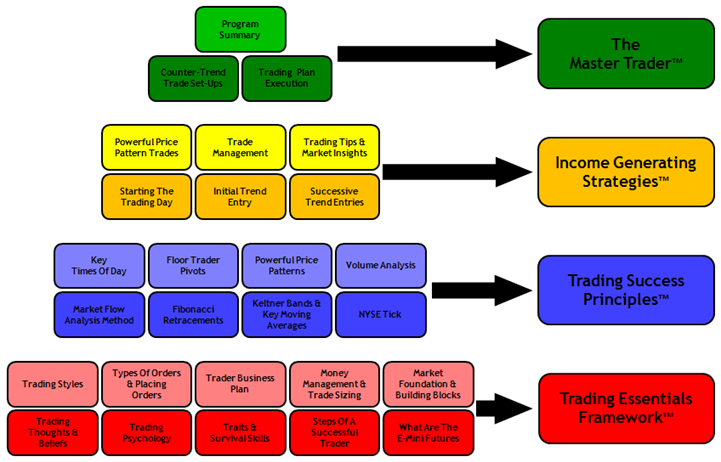 to Building a Trader Business Plan all the way through to the basics of placing an order using order matrices from various software programs available from most trading brokers. Whether you're an advanced trader or a total newbie, there is definitely vital information here for you to help take your trading to a higher and more profitable level. Keltner Channel Bands & Key Moving Averages. You’ll be able to tell, with total accuracy, when a trend begins and ends so that you're rarely ever caught on the wrong side of the market again! Trading is all about stacking the probabilities in your favor, you’ll learn the Key Times of Day when trading opportunities are the BEST and the other times of the day when you want to stay out of the market altogether. I will show you the best and most Powerful Price Patterns that I use day-after-day inside my own personal trading and why I believe these patterns should be the ONLY price patterns you need to know and use! opens at 9:30am ET to showing you exactly when and where you should be entering the market during the trading day, with sniper precision, so your risk is very minimal. That's really the key to making consistent profits with very little drawdown. You'll have everything spelled out A to Z before entering in terms of where to place your initial stop loss, when and where to move that stop so you risk less money, when and where to take profits, and how to trail the market so you can milk it for everything it's worth. In addition, you'll learn the subtle secrets and strategies for trading price action that no one else is teaching as well as trading tips and market insights that stems from over 24 years of trading experience. learns to master. Inside of these 3 Master Trader modules, I go into the details of exactly what you need to know (and master) before you put on a live trade. I also reveal my exact, step-by-step my proprietary counter trend trading strategies (if you don't know exactly what you're doing, you most certainly will find yourself getting stopped out right away and most of the time!). In addition, I've summed everything up for you in the Program Summary module where you'll get my Quick Reference PDF Checklist of the ENTIRE program! This will make it easier for you to execute your trades without any guesswork. I've also included a BONUS PDF for you, where I completely dissect and teach you how to read, with precision, individual price bars. You'll be reading price action like a daily newspaper! ﻿Take Your Day Trading Skills to a Higher & More Profitable Level with the Opening Bell Income Strategy DAILY. You'll Be Coached Step-by-Step through each Trade Set-Up & Learn Exact Entries, Stop Placement, Profit Objectives, & Complete A to Z Trade Management that Will Allow YOU to Learn, Think, Act, & Execute Like A Professional Trader! Learn the Skills on a Daily Basis to Help YOU Become a Consistently Profitable Day Trader & Speed Up Your Learning ﻿﻿﻿TENFOLD﻿﻿﻿! This is a Great Opportunity to Come & ﻿﻿Develop﻿﻿ ﻿﻿﻿Your﻿﻿﻿ Trading Skills Further! 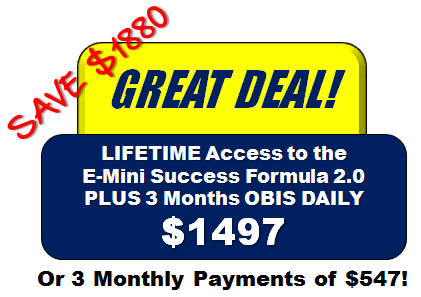 The E-Mini Success Formula 2.0 Mentoring Program Combined with the OBIS DAILY Gives You Everything You Need To Generate Daily Income… Consistently! Private Members Portal - The E-Mini Success Formula 2.0 is delivered ONLINE! You get 24/7 access to your personal members portal. You get to learn from other Trading Concepts students as well. Simply ask your questions directly under the module you're watching and learn from the questions others are asking – you'll be able to interact with other like-minded Trading Concepts students! It will be a FANTASTIC interactive learning community! And of course you can call and email me at anytime as well! Checklists, Strategy Guides, and Cheat Sheets - You get trading Checklists, Strategy Guides and Cheat Sheets to help you organize and understand the trading methodology so that it's both easy and mechanical in nature for you! Honestly, just this information alone is worth the price of the program... and more! E-Mini Success Formula Videos - Videos explaining EVERY single Training Module! Detailed step by step video instruction of actual trade setups... including entries, exits, and trade management examples so that you easily can see how to apply it to your current trading. No more guesswork! It's all very clear and concise and, more importantly, easy for you to apply immediately! Every single training module also contains a PDF for you to read as well. Coaching Session Q&As - Your member’s portal provides you with 8 recorded & archived Coaching Sessions to help you further accelerate your learning & real-world application! UNLIMITED Access to Daily VIDEOs – Exclusive access to my Daily VIDEOs and Charts that are archived on a Daily Basis for YOU. Concise, step by step market analysis that will inform you… and teach you how to make sense of day to day market action using everything you'll learn in the Trading Success Principles. UNLIMITED Personal Email and Phone Support – If you have any questions about the E-Mini Success Formula 2.0, just give me a call or email; after all, that's what I'm here for... to help YOU become a consistently successful E-Mini futures (day) trader, right?! Access to the OBIS DAILY – Depending on which Option you choose (3 or 6 Months)... you'll get immediate access to the Opening Bell Income Strategy DAILY Members Portal, an archive of over 3 and 1/2 years of video instruction and historical charts. 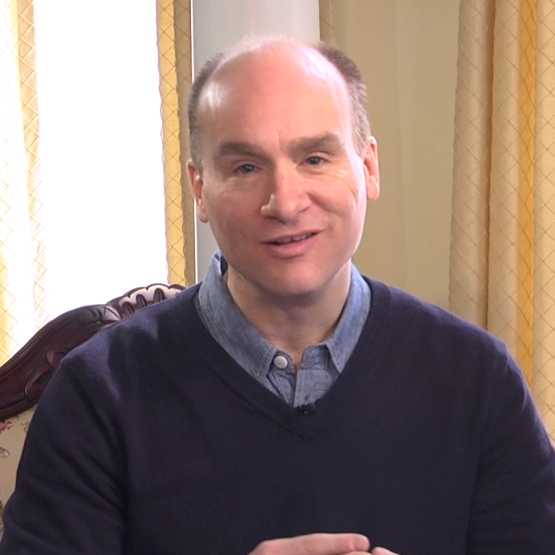 In addition, you'll be automatically registered for Craig’s LIVE Pre-Market Analysis Morning Briefing and Discussion each morning from 8:45am ET to 9:15am ET and his LIVE Market Video Recap and Q&A Coaching Session each afternoon at 4:00pm ET. If you're unable to attend, these sessions will be recorded and placed in the members area for you to review at your leisure. The E-Mini Success Formula 2.0 Mentoring Program and OBIS DAILY were created to help the average retail (day) trader, just like you, generate consistent daily income with low risk per trade. They use the same time-tested, proven trading strategies that professional full-time traders use. The E-Mini Success Formula 2.0 is only open to the first 15 traders… those of you who seek to EARN Consistent Daily Income. Once all 15 membership slots are taken… the doors will close and you will miss your opportunity to PARTNER with me and my team here at Trading Concepts. This is your one time opportunity to start day trading the E-Mini S&P 500 futures market and start generating daily income with low risk, high profit potential trades like the ones shown in the equity charts you’ve seen throughout. Enroll In the E-Mini Success Formula 2.0 Mentoring Program For This LIMITED ONE-TIME Offer Before All 15 Spots Are Taken! 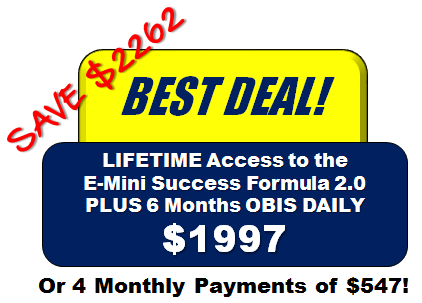 As you know, I like to under-promise and over-deliver, and that’s exactly what I believe I’ve done here with the E-Mini Success Formula 2.0 Mentoring Program combined with the OBIS DAILY. The performance summaries and equity charts speak for themselves! I would love for you to PARTNER with me and my team. Alright, there you have it... if you have any questions, please email me at todd@tradingconceptsinc.com or give me a call on my cell at 248-320-1115. Have a great day and I hope to hear from you soon. P.S.﻿﻿﻿﻿﻿﻿﻿﻿﻿﻿﻿﻿ Look, I've been trading now since 1988 and teaching since 1994, and I'm still as excited and enthusiastic about it as I was back then; I believe trading is the greatest and most lucrative business in the world! I would love to share my experiences with you and teach you everything I know. I'm 1,000% confident that my mentoring program combined with the OBIS DAILY will teach you how to become a Consistently Successful & very Profitable (day) trader and will become a life changing experience for you and your family! The trading strategies you will learn will last for the rest of your trading career... I promise you that! ﻿After much thought and with a lot of family discussion, I have decided to go full time trading. I want to thank you for showing me the ropes. I've been diligently following your daily charts since last October. I know fully why your system works. Having spent a lot of time studying complex electrical and economic systems, and knowing a bit about statistics and fractals, I can fully endorse your trading methodology. This week I was asked if I was interested in returning to a project manager position at the Electric Power Research Institute. I told the Director that I had a better goal. Thanks for sharing your insights with me." Todd, your course is everything one needs to know. Everything you said is true. In these past three months I've been applying your methods and strategies every day. 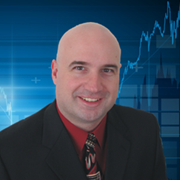 I've seen my trading account consistently rise on a weekly and monthly basis. I've made my mistakes but I'm a much better trader than I've ever been. My next step will be to take your one-on-one training. I thank you for your professionalism and for offering me a chance to become a true TRADER.﻿"
Todd, your course is just great!!! It was really what I needed to finalize everything I have learned to date. I have been going over old charts and data, back testing, etc. and your methods are unbelievable! Someone must switched on the light!!! Thanks again.﻿"
Before I joined your program, my idea of profitable trading was finding that one big winner, that one stock that kept moving higher. But now I’m focused on generating overall account gains and minimizing my risk on every trade. After 9 years of hit and miss trading, I’m finally on my way to end the year with double digit growth.﻿"